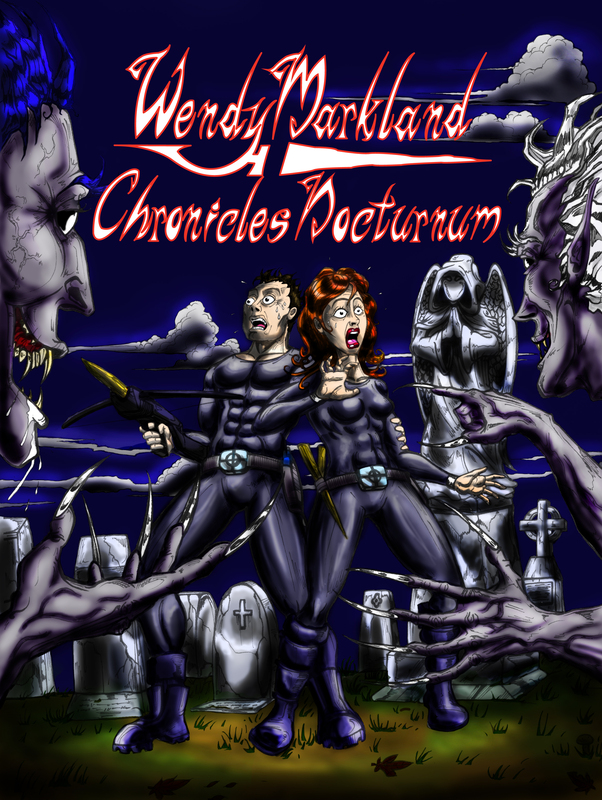 Get in on the ground floor—advertise in the new comic book series “Wendy Markland: Chronicles Nocturnum”! “Wendy Markland: Chronicles Nocturnum” is written, and lettered by award-winning, bestselling, critically-acclaimed author Scott Harper. Pencils, inks, and colors are by artist James Smith. Additional graphics are by bestselling author Desirée Lee. Issue #1 is ready to go to print! “Wendy Markland: Chronicles Nocturnum” is based on Scott Harper’s Wendy Markland novels. We’re looking to fill eight ad pages in the first issue of “Wendy Markland: Chronicles Nocturnum”, bringing the page count up to the standard 32-pages, and off-set the printing costs. This project is being published by a new comic book publisher called Timeless Comics. The book will be launched locally, and grow from there. Because of the limited—for now—release, the rates for these ads are much, much lower than is typical for comic book ads. But advertisers still get the full impact of the name recognition of the team who put this book together! Any businesses in northern California or southern Oregon who would like to take advantage of this rare offer by securing ad space in the first issue of “Wendy Markland: Chronicles Nocturnum”, please contact project creator Scott Harper at Scott@scottharper.net. SALE! Get a 13% discount on every order from Lulu between now and Monday, July 21 by using the discount code FLASHY13 at the checkout. This is the perfect time to grab the original edition copies my first three novels: “Winter’s Rite”, “Well Wishes”, and “Gauntlet”. Enjoy them in paperback, or e-book! I just want to say thank you to all of my fans and readers. No author can do what they do without a fan base. You guys are the greatest! Thank you all for the support of my work. Please, keep writing in; I love getting the messages and the feedback from you all. Calling All Comic Book Stores! Desirée Lee and I have just launched our new comic book series, “Confluence”. Scripts, artwork, and lettering is by us. The series will be published bimonthly by Umbral Press. We are look for indie-friendly comic book shops to stock “Confluence”. Discounts are available for order of 5+ copies. “Confluence” is a science fiction/fantasy mash-up. It focuses on Rue Preston, her best friend Nadine Larson, and the “town pest” Marvin Chambers after the trio is pulled through a dimensional rift to another world. The place where they find themselves is a nexus point where an unknown number of realities join. As such, the world where they have found themselves is a place where anything can potentially happen. Desirée Lee and I are still looking for an Executive Producer for a unique paranormal investigation TV series. I’m not going to give details for the idea here, in such a public place. If you are a producer, please contact us about the project. If you know a producer who might be interested, please have them contact us. We promise a new slant on the genre that has never been done before. Orders of 5+ copies will receive a 25% discount. That makes it easier for those of you who own/run comic book stores to stock “Confluence”. Hint, hint! Scripts, artwork, and lettering are by bestselling paranormal authors Scott Harper and Desirée Lee. The series will be published bimonthly by Umbral Press. Yesterday evening Desirée Lee and I had the pleasure of joining our friend Haywood Macabre on-set of the new film “Covet Thy Neighbor”. Though we had only intended to show up to support Mr. Macabre, and watch as a scene he is in was filmed, Desirée and I wound up being extras in the scene as Mr. Macabre played his guitar in-scene. It was fun—the first time for Desirée or myself being in a movie, and getting to support a friend, and one of his latest projects. Please keep watching for updates on “Covet Thy Neighbor”. Hopefully the tiny bit of film in which Desirée and I appear will make the final cut!